Looking north on Mill Street. Matchett House is not in the picture but is on the right side of the photographer. The history of this building is a little vague. The property existed as early as 1856, but the structure itself was probably built sometime between 1860 and the mid 1880s. The building had a clean front to it and started life as a hotel. Although it had numerous names the one that seems to have the most endurance is Matchett House or Matchett Hotel. 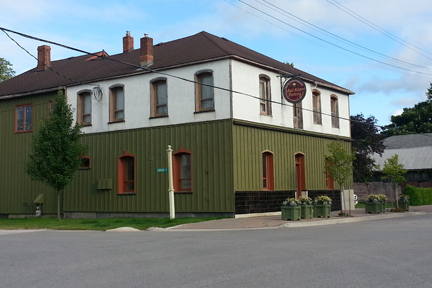 Robert Matchett owned the building from 1878 until 1900 when it passed from him to Alexander Matchett. Some information suggests that the last name of the hotel was Maxwell House. 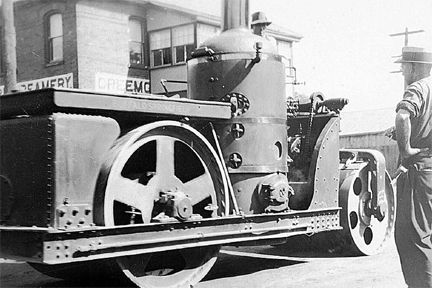 It was sold in the early 1920s and converted to the Creemore Creamery. However there is conflicting information that suggests that it was still a hotel as lat as 1929. The want ad on the left appeared in the Barrie Examiner on Thursday, January 10, 1929. At some point the hotel became the Creemore Creamery and at this time a veranda/overhang at the front door was built. Here is another bit of information that seems to put the lie to the ad. 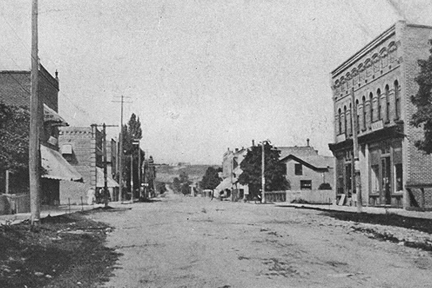 On the left is a photo taken in 1928 of the paving of Mill Street for the first time. Below is a detail from that photograph. The building in the background is the one known as Matchett House or Hotel and it is definitely the Creemore Creamery. Not only that but the verandah/ overhang seems to have been built after it became the creamery as it is covering up the sign. The text on the side of the building is the same style as the text on the front. Just when there was a feeling that some of this was starting to sort itself out, there is the picture on the left from 1979. Below is a detail from this picture. Look carefully at the faded text that passes behind the verandah/overhang. 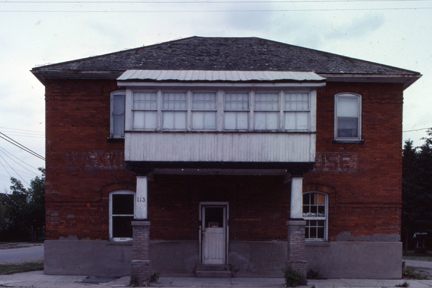 The only thing that is certain is that the building is now the Mad River Pottery at 113 Mill Street in Creemore. In 2013 I received a board from Paul Vorstermans, the owner of the Mad River Pottery. This board came from the verandah/overhang that he removed from the front of his building. This board has some interesting characteristics and harkens back to another story in this project. In the story about the Underwater Wood, I talk about the logging of the great pine trees that used to grow throughout this area. A cross-section of this board is pictured at the right. The two marks on the wood are an inch apart and between these two marks there are 25 year rings. 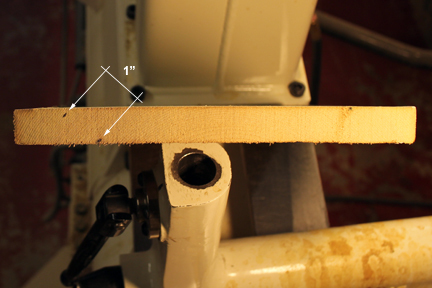 I measured the arc of the year rings and determined that the center of the tree was about 7" away from the bottom edge of the board. The top lefthand corner of the board was about 12" away from the center. This puts the tree at a minimum age of 300 years old. The board was carefully measured to determine the best yield. In designing the bowl that was going to be made from this board I wanted to have some of the original finish to show in the completed piece. To accomplish this a special ring was created. 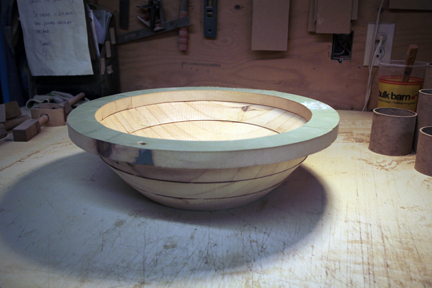 On the rest of the bowl the finish would have to be removed to facilitate gluing and laminating. In the top left of the picture on the right are the pieces that have been set aside for the top ring. 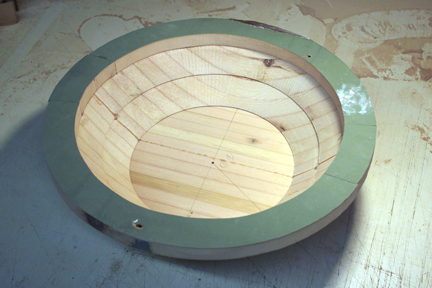 (For more information on the construction of ring bowls, please visit my website at this page.) 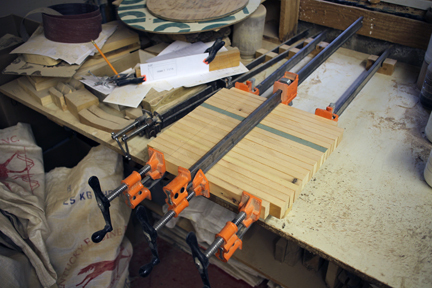 The wood in the center of the picture is ready to be cut into strips and prepared for laminating. 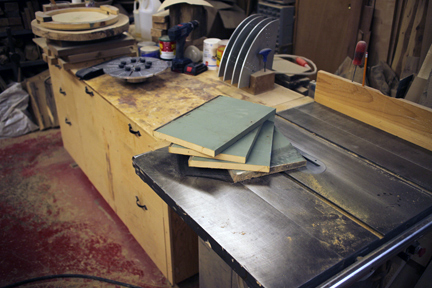 Laminated strips left to dry overnight. The top ring reversed and on the pattern. It is ready to be cut and then glued together. 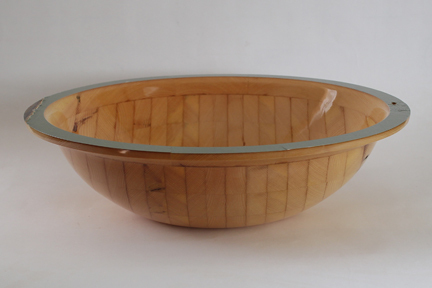 Here is a mockup of the bowl. 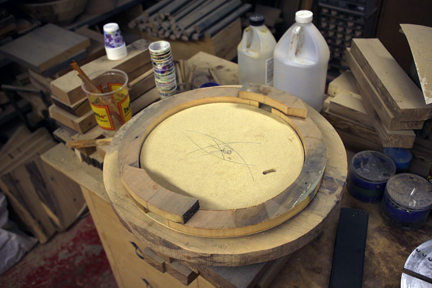 You can see the part of the bowl made up of the laminated pieces below the top ring. Here is the finished piece on the left. I struggled with arriving at a name for this piece because of the varied history of the building. I decided on "113 Mill Street". The only thing fixed in its various incarnations is its address.